Det. 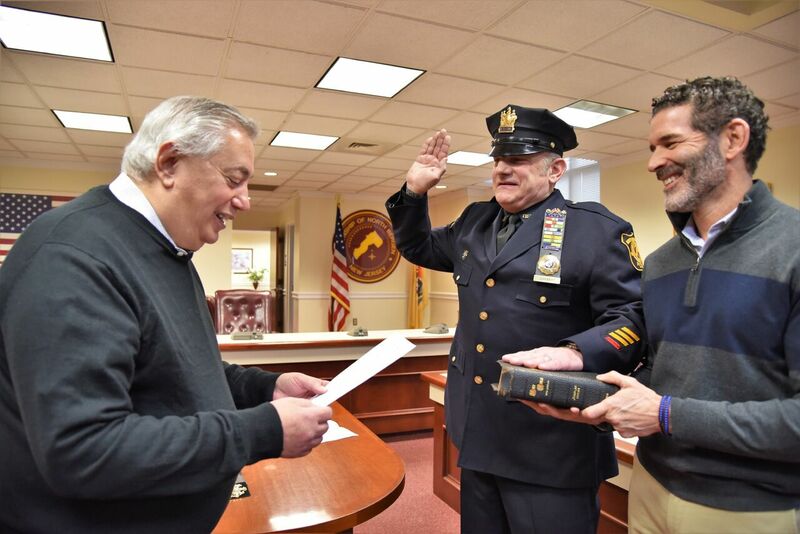 Steven Schubert was promoted to sergeant after being sworn in by Mayor Nicholas Sacco. Photo by Art Schwartz. Mayor Nicholas Sacco was keynote speaker at the recent promotion of Det. Steven Schubert to sergeant. Schubert took the oath of office in a room crowded with friends, family, and police officers, current and retired. Police Chief Robert Dowd praised Schubert for his exemplary work over the years. Schubert has served as an officer in the Patrol Division, Community Police and Bike Patrol Unit, Street Crime Unit, and ESU Team. He is the departmental firearms instructor for pistol, shotgun, subgun, and assault rifle; Monadnock/ASP baton instructor; NTOA active shooter instructor; Taser instructor; CST less lethal instructor; MACTAC instructor; simunition scenario instructor; Sig Sauer, Glock & Colt armorer; and NTOA basic & advance SWAT course instructor. Schubert is a United States Marine combat veteran, serving in Desert Storm and Operation Desert Shield in 1990. Public Safety Commissioner Allen Pascual praised Schubert for his service and participated in the swearing-in ceremony. A remembrance walk will be held for 6-year-old North Bergen kindergartner Neveah Hernandez on Feb. 12. The walk will mark one year since Nevaeh passed away in the hospital after contracting the H1N1 strain of the flu. The walk will be taking place around the lake at James J. Braddock Park from 9 a.m. to 1 p.m; donations will be accepted toward the End-Fluenza project, which aims to increase vaccination rates among children through awareness campaigns. Following the walk, food will be served at the North Bergen Nutrition Center at 1441 45th St.
On Feb. 6 at 6 p.m., the North Bergen Public Library will host a seminar on quitting smoking. The featured speakers will be medical professionals from Hackensack Meridian Health Palisades Medical Center, and the John Theurer Cancer Center. Admission, refreshments, parking, and transportation are free. To register, contact Suleima Rosario-Diaz, MDiv, MSN, AGNP-BC, at 201-854-5793. In a move that may be a prelude to her running for mayor of Jersey City in 2021, Amy DeGise announced that she will step down from her position as trustee on the Jersey City Board of Education. DeGise said she would step down from the board on Feb. 1 to focus her attention on her role as chair of the Hudson County Democratic Organization, to which she was appointed last June. The move comes after Chairwoman DeGise and the HCDO delivered a massive turnout in the November election, helping propel U.S. Senator Bob Menendez to victory with an 85,000 vote plurality. Many believe DeGise’s move will be a prelude to an attempt to unseat Mayor Steven Fulop in the 2021 election. “My focus will be on developing new ways for Hudson residents to get involved in our party through caucuses and committees, with a goal of harnessing the unprecedented levels of activism and civic engagement we’re seeing into meaningful progressive change,” she said. In honor of Chinese New Year, the North Bergen Free Public Library will host a free feng shui workshop at 6:30 p.m. on Thursday, Feb. 7. Feng shui (literally “wind-water”) is an ancient Chinese art/science developed thousands of years ago to help improve life by creating the optimal and harmonious flow of energy within a space. Enjoy the seasonal festivities by joining Ivy from “Who Moved My Chi?” as she provides easy feng shui tips for your home and office. The workshop is free, and so are the Chinese snacks and refreshments. To learn more about Ivy and the services she offers, visit www.whomovedmychi.me. According to the Chinese calendar, the year of the pig begins on Feb. 5. Celebrations can last for a week or more. The library will hold two additional workshops to keep the celebration going: Chinese Paper Folding and Cutting at 4:30 on Tuesday, Feb. 12, and Qigong on Thursday, Feb. 21 at 6:30 p.m.
For more information visit www.nbpl.org or call 201-869-4715. The North Bergen Free Public Library is at 8411 Bergenline Ave.
Soccer registration will take place for ages 6 to 16 through Feb. 28. Register between 2 and 9 p.m. Monday to Friday at the North Bergen Recreation Center, 6300 Meadowview Ave., or at the white trailer by the soccer field in North Hudson Park from 5 to 8 p.m. Monday through Friday, or from 9 a.m. to 2 p.m. Saturdays. Proof of residency is required, along with a birth certificate/passport, one current passport-size photo (no photocopies), and a gas/water/electric/home telephone/cable bill. No cell phone bills accepted. A nonrefundable $35 registration fee is required. Any form of payment is accepted. Bring exact change if paying in cash. Registration is open to North Bergen and Guttenberg residents only. Additional restrictions apply. Mayor Nicholas Sacco and Commissioner Hugo Cabrera announce the opening of T-ball and baseball registration for ages 4 through 17. Registration is available Monday through Friday from 2 to 9 p.m. until Feb. 28 at the North Bergen Recreation Center, 6300 Meadowview Ave.
Registrants are required to provide proof of residency and a birth certificate/passport. There is a nonrefundable $35 fee. All forms of payment are accepted. Anyone interested in coaching, contact the Recreation Center at 201-861-9601. Mayor Nicholas Sacco and Commissioner Hugo Cabrera announce the opening of girls’ softball registration for ages 7 to 18. Registration is available Monday through Friday from 2 to 9 p.m. at the North Bergen Recreation Center, 6300 Meadowview Ave.
Registrants are required to provide proof of residency and a birth certificate/passport. There is a nonrefundable $35 fee. All forms of payment are accepted. Registration runs through Thursday, Feb. 28. EZ Ride shuttle services will holding an open recruitment on Feb. 12 from 9 a.m. to noon at North Hudson Community Action Corporation, 400 38th St. Suite 214, Union City. Recruiters are seeking CDL drivers for full time and part time positions, with both a.m. and p.m. shifts. Candidates must have a CDL license with a “P” endorsement, and must not have a “Q” restriction. A clean driving record and ability to communicate in English and fill out reports and forms are necessary. Competitive compensation is offered. For more information, call or email Carla Gonzalez-Rios at 201-939-4242 ext. 138, or at cgonzalez-rios@ezride.org.